It reminds me how the Champion NBA player Kobe Bryant of Los Angeles Lakers once responded in an interview, "There are certain people that have a tremendous hunger. There are certain people that have a will, determination and hunger that you need to be the best in the world. Those people and those people alone become champions." Sachin Tendulkar has been no exception. He puts in all his blood loves playing the game of cricket with meraki. Other word for Sachin I could think off immediately at this point of time being altitudinarian. Last week while I was back home from work switched on the television to watch news while having my dinner the only thing that was shown on all the news channels for extended length of time was the coveted book launch the autobiography of the greatest batsmen of all times holding the title "God of Cricket" namely Sachin Ramesh Tendulkar. 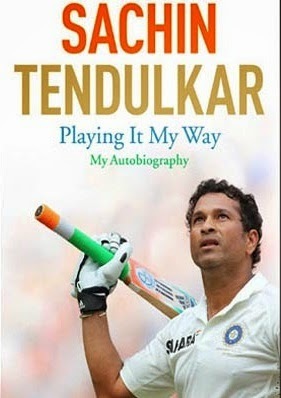 Publisher Hachette India has come up with his autobiography titled Sachin Tendulkar: Playing It My Way. Even today’s new movie releases would not get so much electronic media coverage as much as this star studded book launch got it which was followed by panel discussions. Let me take this opportunity to pen down the book review on Sachin Tendulkar’s latest book his autobiography. Born to a Maharashtrian family in Mumbai’s based in Bandra Sahitya Sahawas Colony having two brothers and a sister and Sachin being the youngest. His father, Ramesh Tendulkar was an acclaimed Marathi poet, critic and professor while his mother Rajani worked for the Life Insurance Corporation of India (LIC) office based in Santacruz. The very first chapter in this book titled “Childhood” talks about the words of his father that are registered in his mind even today. If you remain humble, people will give you love and respect even after you have finished with the game. As a parent, I would be happier hearing people say, “Sachin is a good human being” than “Sachin is a great cricketer”. The teaching and upbringing from his parents and blessings he receives from his fans spread across the globe makes him the admired and respected personality. The book would not be complete if there is no reference to his wife Anjali the best partnership of his life who has been with him always in his best as well as bad times - Anjali Mehta becomes Anjali Tendulkar. It was on Sachin’s 21st Birthday that they both engaged. The curiosity factor always remains in the eyes of the common masses how and where Anjali met his better half. Well, Sachin had just landed in Mumbai from the 1990 tour of England and was waiting to pick up his bags when he saw an extremely attractive woman looking down from the viewing gallery in the airport. Anjali was wearing an orange T-shirt and blue jeans. While coming out of the airport his dear friend Sachin Harshe said softly in ear’s of Sachin that a very good looking girl was calling his name and was very keen to meet him. But, with his brothers Ajit and Nitin around Sachin was too apprehensive to speak or meet Anjali in person. The fact is love can’t be arranged it just happens. A very interesting and comprehensive autobiography I must say with interesting anecdotes. Those were the days when Sachin was not out on 94 at the end of the first day. Just few days before this match Sachin had invited his mentor Mr. Ramakant Achrekar at his home for dinner. Sir, agreed for his dinner invitation but only on the day when Sachin would score his first hundred in school cricket. The next day Sachin who was not out on 94 on day one scored his hundred and true to his words Mr. Achrekar came to Sachin’s home for dinner that night which was the most satisfying moment for him. The book has been supplemented with many colored pictures including the notes of his speech that Sachin carried with him on his last day in International Cricket. What I like about Sachin is apart from the profound respect he has towards his parents it’s also the reverence he has towards many individuals that came in his life especially to sum it up in his own words his Sir Mr. Ramakant Achrekar. When people get exalted success the tendency is to get carried away and forget one’s own mentor which is not healthy. Well, experience enriches our life and we should learn from such role models in the journey of our life. To the voice of all my readers Happy Reading !!! Sachin Tendulkar: Playing It My Way. I do hope you all find reading his autobiography enlightening as much as I did. To sum it up in Sachin's own words it is his life between 22 yards for 24 years.